eCoach 57: Building Your Business Fast with Carissa Hill – Ultimate Wealth, Inc. When it comes to building your business, there are a few things we all run into that will often cause us to get stuck. What’s the best way to breakthrough to the next level? One way is to learn from people who have been there and who have found a way to navigate their way through to the next level. While the entrepreneurial journey is indeed a lot of fun, it can also challenge you on many levels. In the end, you learn and you grow. In this episode, my very special guest, Carissa Hill is a woman who continues to find a way to take her business to the next level. She’s a brilliant inspiration and her story is sure to inspire you as it has me. Enjoy this episode and be sure to share it with your friends and followers as well. Carissa Hill is a serial entrepreneur, author, international speaker and business coach specializing in helping women business owners scale and grow their businesses to six figures and beyond. 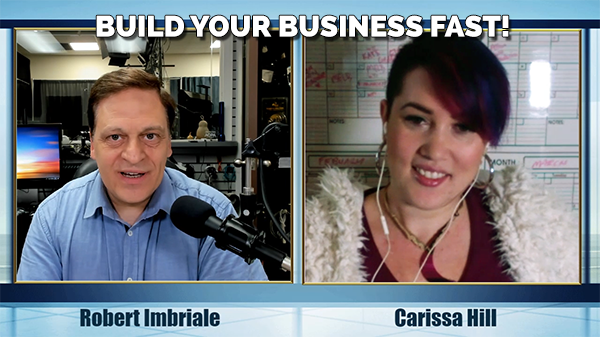 In her book Grow Your Business With Facebook, Carissa shares the story of how she used Facebook to quickly grow her businesses and then systematize and set them up to run without her personally doing the work. By her mid-20s, Carissa built a chain of hair salons and ran a successful hair extension wholesale business. Her unique approach to focusing on growth and prioritizing activities geared toward scaling allowed Carissa to build her coaching business to multiple six figures in under two years. Her clients typically double and triple their businesses within just a few months, using Carissa’s strategies. In her online video show Coffee with Carissa, she offers solutions to her followers marketing and business growth questions in a Q&A format. Originally from Northern Rivers, NSW, Carissa lives in Brisbane Australia with her husband Travis and their two year old toddler, Jayden. A true lifestyle entrepreneur, in her free time Carissa enjoys traveling internationally and spending time with her family and her pets: her cat Pepper and her white toy Pomeranian, Pebbles.